Rogue One is showing why veteran directors still matter. Director Gareth Edwards on the set of Rogue One. For a few years, it looked like Hollywood had disrupted directing. Like Silicon Valley start-ups trying to do away with inefficiencies, multiple studios had managed to forego veteran directors in favor of young, inexperienced upstarts—and it seemed to be working. At the front of the pack, Marvel had handed its two flagship films, The Avengers and Avengers: Age of Ultron, to Joss Whedon, a filmmaker known more for his facility with characters and dialogue than any action expertise. MCU mastermind Kevin Feige then gave the Captain America franchise to Joe and Anthony Russo, who had done the bulk of their work on sitcoms like Community and Happy Endings. For these gambles, Marvel was rewarded with three of the 12 highest-grossing movies of all time worldwide; the Russo brothers are now slated to direct the next Avengers installment. At the same time, Colin Trevorrow, a 38-year-old with all of one theatrically released feature under his belt—the micro-budget indie Safety Not Guaranteed—got the job to reboot the Jurassic Park franchise. Gareth Edwards went from Monsters, a $500,000 movie that barely got an American release, to critical darling Godzilla. Sam Taylor-Johnson turned Fifty Shades of Grey into an international hit with only one previous credit as a director, 2009’s Nowhere Boy. And Warner Bros. named Jordan Vogt-Roberts, who’d made coming-of-age movie The Kings of Summer and some episodes of You’re the Worst, the director of the upcoming Kong: Skull Island. Edwards, of course, chose as his follow-up to Godzilla the first Star Wars spinoff, Rogue One, meant to herald a new series of stories located in the same universe as the main films. As far as high-pressure assignments go, this was basically the volcano in Volcano, but Edwards got off on a confident foot, announcing his vision to make Rogue One a war movie. Then he saw Star Wars: The Force Awakens become the top-grossing film in domestic box-office history. When rumors of reshoots and discontent leaked out in June, then, it wasn’t exactly a shocker. Lucasfilm reportedly bristled at precisely the “war movie” qualities that Edwards had touted when he joined the project. Meanwhile, the shine was coming off the notion of the new young director reinvigorating a franchise: Josh Trank’s Fantastic Four cratered amid reports of Trank’s immaturity on set, and other relatively untested studio filmmakers, including Cedric Nicolas-Troyan (The Huntsman: Winter’s War), James Bobin (Alice Through the Looking Glass), and Dave Green (Teenage Mutant Ninja Turtles: Out of the Shadows), struggled at the helms of big-budget tentpoles. Of course, veteran directors’ movies flop, too: Steven Spielberg and Warren Beatty are about as experienced as it gets, and The BFG and Rules Don’t Apply are two of the biggest underachievers of 2016; Roland Emmerich’s and Ron Howard’s history with their respective franchises couldn’t make Independence Day: Resurgence and Inferno work; and just ask Gus Van Sant how much his track record helped The Sea of Trees. The graveyard of famous flops is filled with expensive movies directed by white men who had directed a million other expensive movies already. But veteran helmers’ greatest asset is also the reason they’ve been falling out of favor: their distinct, individual identities. When Marvel began its move toward young filmmakers, the party line was that it encouraged a fresh, unique perspective. However, most people suspected a very different reason: It gave the studios more power, both creatively and logistically. If you hire Steven Spielberg to direct a film, it becomes a Steven Spielberg film. If you hire Joe and Anthony Russo, two names essentially unknown to anyone who doesn’t hang out on the Community subreddit, your studio retains control over the movie’s identity. This is how Marvel can make a dozen films with a handful of different people in charge, and have them all be more or less alike. For Marvel, this has worked magnificently, and much of that credit can be heaped at the feet of Feige—in place of a bigger directorial name, he has functioned as the captain of the Marvel ship, steering the unprecedentedly ambitious amalgam of movies, characters, and source material through ten years and billions of dollars. Where these megafranchises have lacked a unifying figure, though, they’ve struggled, the most prominent example being Warner Bros.’s DC films, Batman v. Superman: Dawn of Justice and Suicide Squad, directed by Zack Snyder and David Ayer, respectively. Both made a bunch of money, but they left a sour enough taste in the mouths of moviegoers and their parent studio that they forced major leadership changes. This is the fate that Lucasfilm will do anything to avoid. While the company has a Feige-esque character in Kathleen Kennedy, they’ve been more open to hiring directors whose brands are already established. Franchise-filmmaking ringer J.J. Abrams helmed The Force Awakens, bringing along his customary snap zooms and lens flare. Rian Johnson, the brainy cult hero behind Brick, Looper, and some of the best Breaking Bad episodes, is handling Episode VIII; Trevorrow, now a known quantity himself, got IX. And the Han Solo movie, which will be the second of the three planned spinoffs, went to Phil Lord and Christopher Miller, who have developed a signature style across the Lego Movie and Jump Street franchise. With the relatively unique Godzilla under his belt, Edwards also played into that narrative, and around the time of his hiring, Lucasfilm execs consistently said they wanted the spinoff movies to be filmmaker-driven. But this week, it became unclear who exactly the filmmaker in the driver’s seat might be: THR reported that Tony Gilroy, the hugely respected scribe behind the original Bourne trilogy and the writer-director of Best Picture nominee Michael Clayton, had been far more involved than previously thought. 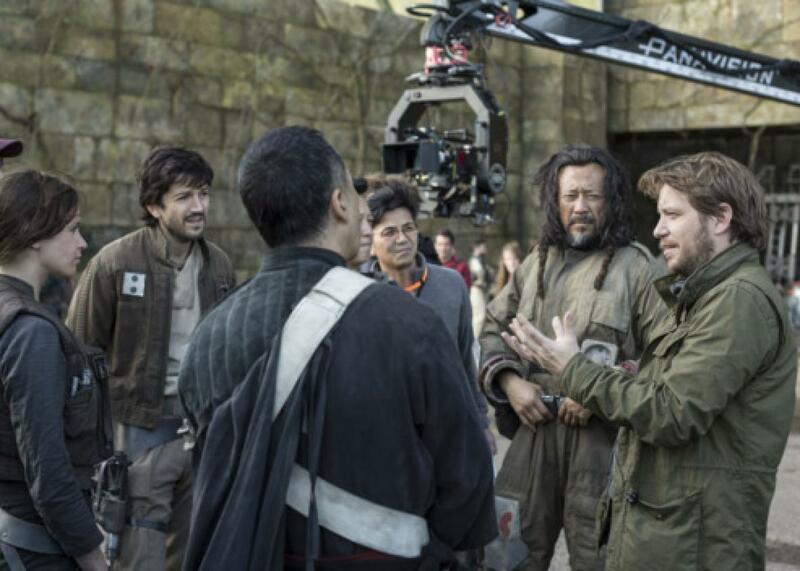 After coming on to the project as a $200,000-per-week consultant, Gilroy has reportedly earned $5 million so far for his work on Rogue One, said to include overseeing the reshoots, rewriting part of the script, and reworking the ending. It’s very common for filmmakers of Gilroy’s caliber to come onto a studio project as hired hands, and rumors about who’s worked on what movie are a regular feature of Hollywood gossip. But it’s rare for that kind of involvement to become as public as Gilroy’s has been, for obvious reasons: It undercuts the ownership of the original director, and it implies skittishness on the part of the studio over the film they’re being delivered. More than that, though, Gilroy’s work on Rogue One—and it should be noted that we don’t know the exact nature of what he did—suggests that this whole franchise-filmmaking thing is harder than anyone’s been willing to acknowledge. For Disney, Marvel and Star Wars seem to be a license to print money, the only sure thing in a Hollywood in flux. The company has had great success plugging directors like the Russos, James Gunn, and Scott Derrickson into the MCU directors’ chairs. But those men also had Feige to draw on, as well as an established template of what their films should be, giving them license to bring their own flair, whether that be Gunn’s humor or Derrickson’s trippy visuals. For Edwards, though, the task of directing Rogue One was even more complex than a blank slate: He had to make an original film that would also rhyme with its hallowed predecessors, fitting into a bigger world in ways that few movies have ever had to accomplish. At least on the surface, Gilroy’s expanding role—he already had a credit on the screenplay—conveys the impression of a task that was too big, or at least too unwieldy, for the relatively novice director who assumed it. Or perhaps it represents buyer’s remorse on the part of Lucasfilm, which decided that it needed a steadier hand guiding its gold-plated baby. It’s certainly not a dig at Edwards to say that Tony Gilroy is a more established, experienced, and battle-hardened maker of movies, who’s had the experience of writing and directing a spinoff before. While nothing can prepare a person for doing a Star Wars film, Gilroy appears to be more prepared than Edwards, and the visibility of his involvement reinforces that impression. Hollywood might have tried to do away with veteran directors, but the more demanding these blockbuster assignments have become, the more the appeal of the old hands becomes apparent. At the very least, the allure of a fresh face has been complicated. Age still ain’t nothing but a number.